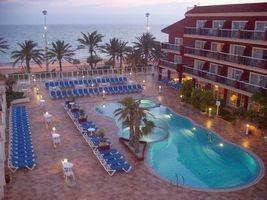 The Neptuno Hotel has a superb beachfront location in the popular resort of Playa de Palma. It is a convenient place to stay being just 15 kilometres from Palma with its vibrant cafe culture and entertainment venues and 10 kilometres from the nearest golf course! The Neptuno has 114 comfortable guest rooms, most of which have a sea view, and there is an excellent choice of facilities - particularly for cycling enthusiasts. The white sandy beach is 5 kilometres long and has a lifeguard service with water sports at either end - perfect for sun worshippers too. There are numerous beach bars and restaurants along the vast promenade overlooking the ocean which have a really friendly atmosphere and are open late into the evening. The Neptuno Hotel is an excellent choice for sun filled, fun packed and relaxing family holiday.